Have the exterior of your home or business sparkling clean with pressure washing services from Thinking Global Painting Co. in Eugene, Oregon. Additionally, our company offers painting services, and trim work to restore the beautiful look of your molding. Power and pressure washing services will help determine if your home needs a paint job. Some homeowners paint their houses just because they are dirty. Pressure washing the outside of your house will take anywhere from a couple hours to one full day. Our company uses eco-friendly, biodegradable wash that does not damage flowers or plants. 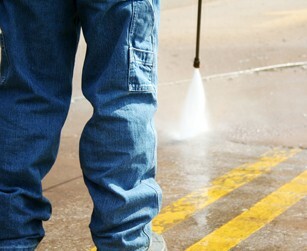 We use a 3500 PFI professional power washer with selectable pressure. Finished trim is the molding at the floorboards and windows of your home. Our technician's repair, refinish or replace trim. Generally, people replace trim when it is broken, when they are replacing a door or a window, or when an animal scratches it. Other problems include moldy and sun-bleached trim. Trim replacement takes anywhere from an hour to a week for the whole house, depending on the job. Contact us today to request a bid for pressure washing or trim replacement from Thinking Global Painting Co in Eugene, Oregon.